I took time out recently to visit a Promotional Merchandise Seminar in London. I went along with the preconception that I would be shown the same old merchandising that we’ve all used as give-aways. You know the sort of stuff, pens, mugs, USB sticks, rulers. I was pleasantly surprised, however, to find an array of different ideas at the event that I hadn’t really considered before. You know what it’s like when you’re ploughing through a promotional gift catalogue or website; you tend to become a tad blasé about the whole process and can easily miss the point about why you’re considering branded merchandise in the first place. This follows that the humble branded mug (given to you freely by one of your suppliers) that you use at work (or at home if you like it that much!) sees action around 4-5 times a day. And, assuming that you use the same mug every day, you are constantly exposed to their brand every time you have a cuppa. Now, that’s great product/brand placement. ‘Ah’ I hear you say, ‘but mugs are so boring!’ Well, I thought the same until I was shown the different styles and finishes you can now achieve in this age of modern screen printing. I was also surprised at the affordability of some very classy products. Let’s be honest, we all like a bit of class even in the guise of the simple mug. The same goes for pens, rulers, etc. There is a massive range of promotional items out there. The trick is to decide how you want to use them. Here are some considerations when choosing promotional merchandise. Choose a product that relates to your identity and is useful to the recipient. It will help increase the awareness of your brand. What are you using it for? Choose merchandise that is relevant to your event or marketing campaign/strategy. Use promotional merchandise as an effective and free giveaway marketing tool when exhibiting on your exhibition stand – pre, during and post your event depending on what works with your marketing for the event. Use as an ideal direct mail piece to a carefully selected database of prospects and customers but be careful of the postage costs – an e-shot to ‘claim’ the free gift may be a more cost-effective alternative. As a thank you to your clients for their business (do Meerkats ring a bell?). Use promotional merchandise as thanks to your hard working staff to help build staff morale. Use as part of a product/service launch by choosing a gift that will remind visitors of that launch. Think carefully about how you use promotional merchandise. You want to leave an impactful impression on your prospective and existing client. There are lots of clever ways you can make merchandise work for you and at a price that suits your marketing spend. It’s all a matter of thinking it through and choosing the right product that fits your brand or promotional activity. In the meantime, enjoy your mug of tea …. Our friend and colleague Robert Duncan has recently won two prestigious awards at the IAC Film and Video Institute International Film Festival. 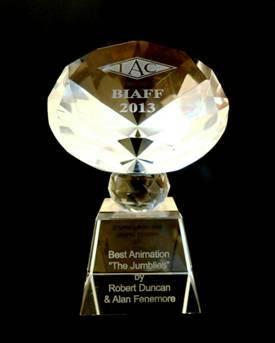 These are for Best Animation 2013 and the 2013 Diamond Award. We’d like to extend our heartiest congratulations to Robert and his co-winner Alan Fenemore for this fine achievement - and this will undoubtably help to showcase their brilliant talent and creative approach to this flexible art medium. The 4 minute movie is here http://www.youtube.com/watch?v=3_7jHCEMxZY – and Robert’s available for corporate work too! WSM were awarded the business having presented Ideas that fitted the client’s brief and business philosophy in a dynamic and interesting way. WSM built the site which incorporated two user login channels and an easy to use CMS. The site is fully optimised and includes links to social media platforms for more integrated engagement. 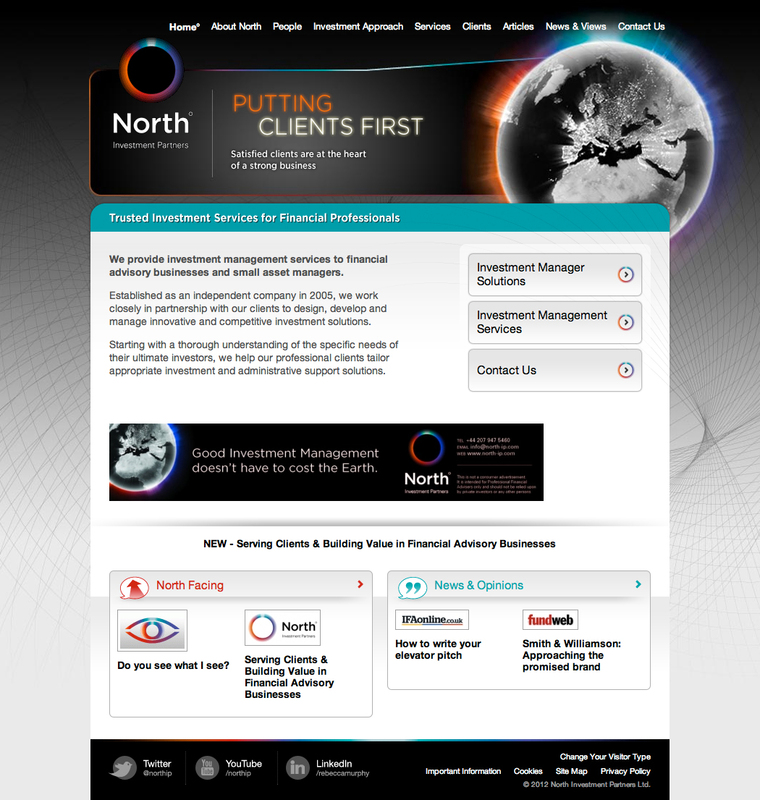 The site went live in September and has received positive feedback from the client and industry users. If you want to see discuss your website requirements, please give us a call or email gary@west-street-marketing.co.uk with your details. Creating a buzz….but keeping it simple. West Street Marketing recently produced a simple but visually exciting exhibition stand that worked hard to attract visitors – by appealing to their appetites! The brief was to create a buzz on one of our client’s exhibition stands at ACB Focus 2012 at the ACC Liverpool. The client, Beckman Coulter, didn’t want to show any specific products because of space restriction but still wanted to entice attendees onto their stand for data capture and lead generation. West Street Marketing created a dramatic image and a simple message that would relate well with the scientific audience attending the show. The position of the client’s stand was opposite a coffee area which opened up an opportunity to take advantage of that footfall. When delegates gathered around the coffee area during their seminar breaks we invited them to enjoy a free Krispy Kreme Doughnut in exchange for their business details. A fair exchange we thought! everyone remembered the free doughnut they enjoyed. If you want to see how you can get more out of your exhibition stand, please give us a call or email Tony@west-street-marketing.co.uk with your details. How the small exhibitor can make their stand….. stand out! 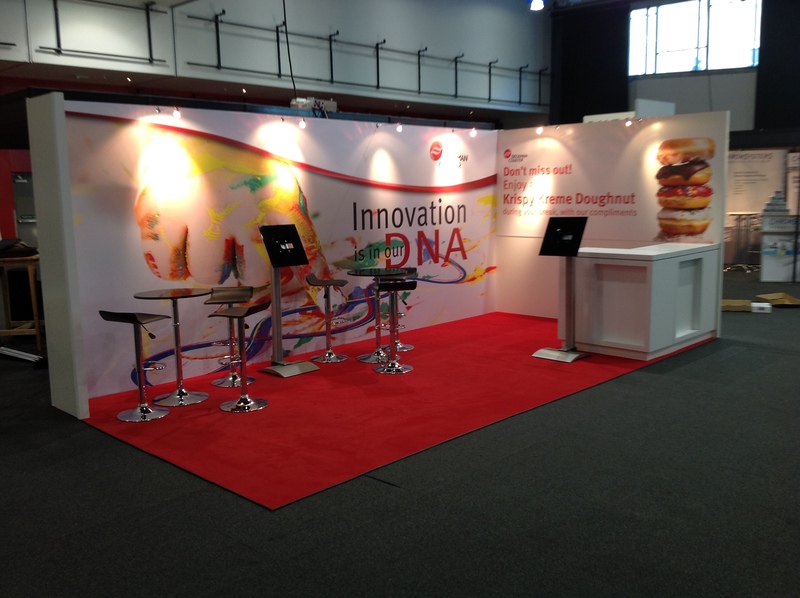 Think about the position of your stand within the exhibition hall or event location when buying your exhibition space. Not everyone can afford a prime position so always consider the next best option based upon visitor traffic around the exhibition. Corner sites are always a good option as they are on a cross road where traffic can be busiest. If possible grab a position near a refreshment area or, dare I suggest, near the toilets! They’re both very busy areas. 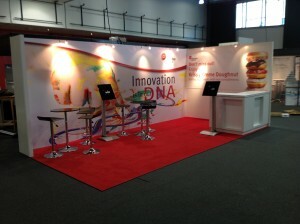 Many small shell scheme stands use graphics or pop-up stands to deliver a message. If the design and text on your graphics is not thought about carefully, it can be confusing. Put yourself in the place of someone visiting the show. They want to be able to understand your offering within a couple of seconds of visiting your stand. So many times I see stands that don’t deliver the right message and do not explain in simple terms what they do. Keep your message simple and use interesting imagery. Few people want to spend time reading long and dull explanations. Don’t clutter your stand with sales people. If you have a small stand, one or two people at the most is all the staff you need. Rather than standing or sitting on your stand, move slightly off the stand and allow people to get a good view of your offering before you approach them. This allows the visitor to digest your message quickly and is a far less intimidating experience for them. I personally get offended when I am approached by someone on a stand asking “how I am”. As if they care! A popular method used to engage with a prospect is to ask the visitor if they are interested in what you are offering. Get to the point and don’t waste your time and theirs if they are not interested. Keep your stand tidy. Get rid of the old coffee cups and half eaten sandwiches. Better still, take a break away from the stand to enjoy a much needed bite to eat. It’s much better for your staff and avoids an unattractive conversation with a mouth full of baguette. is all you need. Keep it simple but interesting. If you are going to give something away to visitors at your stand, make it interesting and relevant to what your company is selling. I’m not decrying the cheap give-aways like pens, etc, but sometimes it is worth considering quality not quantity. Think of something useful and memorable. Be selective to who you hand your give away to. After all, it’s your money you are handing out and you want to get a return on your investment. portray the best image for your company. However tired you might be, smile and be happy! After all, you’re there for one thing only – to gather more leads, to gain more business which in turn will improve the prospects of your company – and you! Les Barnes, director of West Street Marketing, became a Dragon for the day to help launch a new Uxbridge College initiative. Design students at Uxbridge College pitched against each other to create a logo and branded email for a mortgage company – and win an Apple iPad in the process. The 14 Uxbridge College students created designs for Graf Mortgage Corporation, and pitched in front of a panel of three ‘dragons’ including Steven Cochran, who is Director of Graf Mortgage and the college’s vice-chair of Governors. Other dragons were Lucy McCann, Head of Marketing at Uxbridge College, and Les Barnes, director of West Street Marketing Ltd. The winning designs were by Kenny Ogunneye, aged 17 from Hayes, and are now due to be worked up for use in a marketing campaign in the Spring 2012. The competition marked the launch of Uxbridge College’s Young Dragons Society and was held in Hayes Business Studios, a facility for start-up business, at the college’s Hayes Community Campus. West Street Marketing is delighted to be able to support Uxbridge College in this initiative as part of its business mantra of supporting local community programmes that encourage young people to fulfil their potential. Welcome to our very first Blog on The Street. We hope to build a friendly, insightful and collaborative community here, offering helpful marketing advice and support to those who need it. We celebrate our ‘Blog-launch’ with news that our growing team are joined by an old friend and colleague, Robert Duncan. We have worked with Robert in the past and we welcome him again to The Street along with his many creative attributes including his animation work. We thought you’d like to see an example of his skills here http://www.youtube.com/user/TheMarketingstreet?feature=watch and will also pose the following related question for your reaction. We ask this because it seems that, whilst the creative process remains the same, the ability to quickly transform these thoughts into visual concepts appears to have been muted by technology. We’re not by any means suggesting that the advancement in technology (especially on the design front over the past 2 decades or so) has not been a positive one for the marketing industry. We have been as indulgent in the employment of ‘Mac Artworkers’ and ‘OnScreen Designers’ as the next creative business. But the ability to draw something ‘on the hoof’ – to quickly transform an idea, wherever you are, into a storyboard or picture (along with typographical additions for headlines or body copy) appears to have become a lost art – even with the advent of the Tablet. Where is the next generation of visualisers? Where are the creative geniuses that can competently and excitingly envisage a client’s idea by simply sketching the ideas onto paper… for all to see? Are you impressing clients with this dynamic approach to the creative process by drawing what everyone’s thinking, there and then? Or have you become resolved to using the technological route where the raw personality of your approach seems muted and disparate from the original creative thought? We’d love to hear from you if you’re involved in the creative field or indeed have used a creative agency that have somehow lacked the spontaneity and ability to proffer a hand drawn creative proposal. Is it that important or should it be seen more? We look forward to hearing from you. See you on The Street soon – bye!